On this episode of Working: Syracuse, we speak with Mirvat Essi Sande, owner and sole hairstylist of Salon 515, which sits in the heart of Westcott Nation, an eclectic neighborhood known for attracting students, young professionals, artists, and activists. Inside, the salon resembles an apartment, which Sande designed to create the sense that clients were entering her home, and the conversations flow freely. Whether it's a restaurant recommendation, the president's latest tweet, or an escape destination for her or her client's next vacation, Sande enjoys and encourages conversation. The salon sits above a bar called Taps, a former funeral home owned by Essi Sande's brother and a favorite hangout for those looking to have a beer and catch a Syracuse University game. In fact, two additional businesses — Munjed's and Mom's Diner — on that three-block stretch, are also owned by relatives of Essi Sande, who moved from Jordan to the neighborhood with her 10 siblings in 1968. 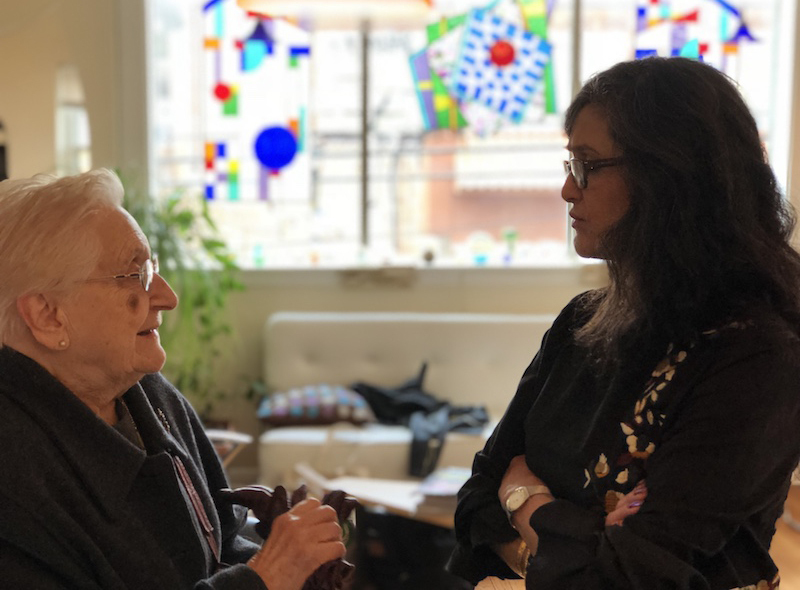 Mirvat Essi Sande, owner of Salon 515, chats with longtime customer Annamaria Moneti about family and upcoming plans. Moneti moved here from Italy with her husband, and they both taught at Syracuse University. With each client, Essi Sande considers it crucial to communicate and ask questions since terms such as "layering" may mean something completely different to the person in her chair than it does to the next client. 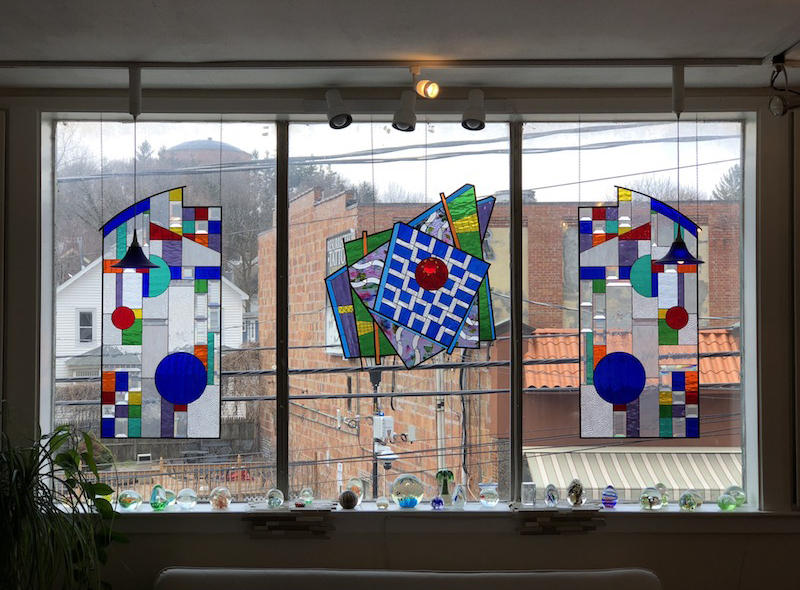 One window in Essi Sande's salon features two stained-glass-window panels created by her sister-in-law, Peggy Pulling. The third is a gift from her sister, Muna Pulling, who wanted to thank her for years of treating her niece and nephews to haircuts. 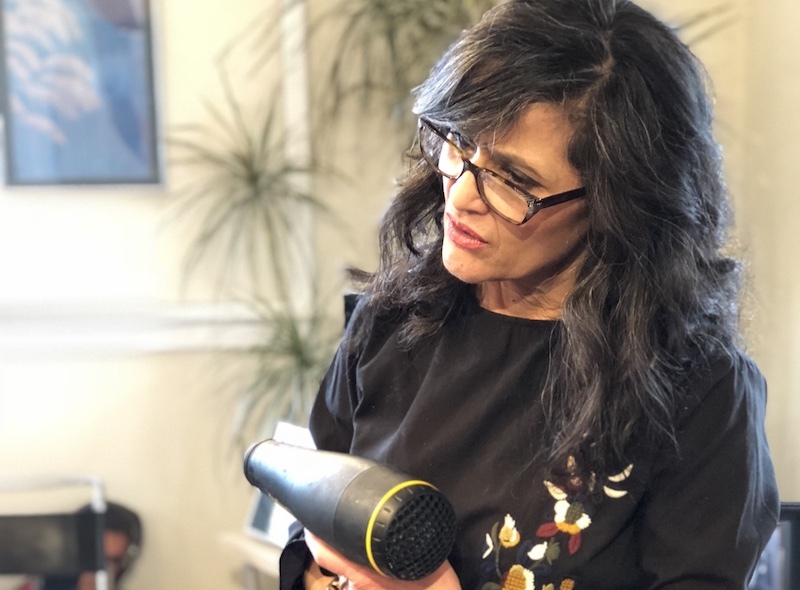 Essi Sande doesn't hesitate to stop while cutting or drying hair to listen and give her client more attention — no matter the topic or time limitations. Essi Sande with her twin brother, Midhat. He often visits the salon to chat with her and her clients or to get a cup of coffee. BRONTE SCHMIT, HOST: Hello and welcome to Working: Syracuse, the podcast inspired by journalist Studs Terkel featuring Salt City residents talking about what they do to earn a paycheck and how they find meaning in those jobs. I'm your host Bronte Schmit. 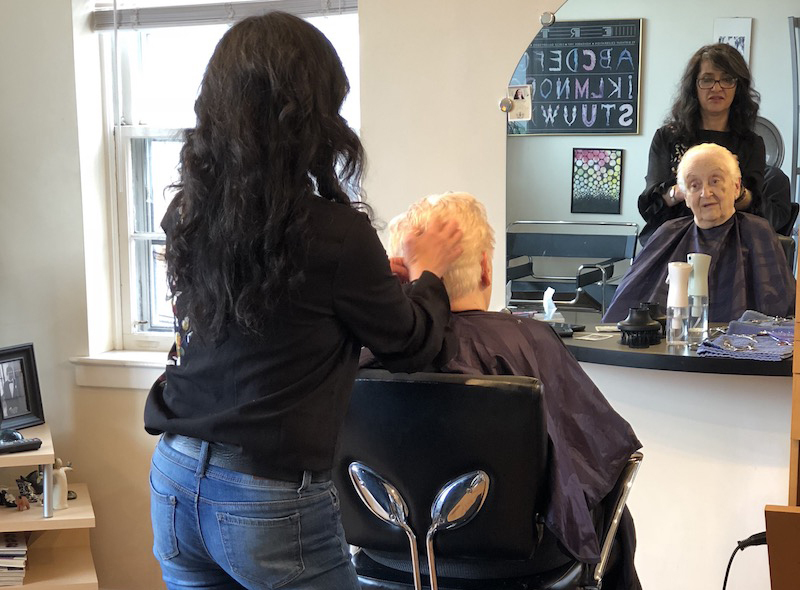 In this episode reporter Matt Mitchell spoke with Mirvat Essi Sande, a hairstylist and the owner of Salon Five Fifteen, overlooking Westcott Street. The surrounding two block neighborhood — known for hipster funkiness — features a vintage clothing store, live music venue, and coffee shop. Beneath Mirvat's salon sits Taps, a funeral-parlor-turned bar, one of several properties owned and operated by her siblings. As a reminder, the views expressed in this episode are those of the subject, and do not necessarily reflect those of the Working: Syracuse staff. MATT MITCHELL: There are more than two dozen hair salons in the city of Syracuse. Entering this one, you'll see a large Elvis clock and blown-glass paperweights on the window sill. And at the center stands Mirvat, this salon's sole stylist. MATT MITCHELL: Light pours in through large windows, and the sun filters through stained-glass panels. MIRVAT SANDE: I'm Mirvat Essi Sande, I own Salon 515 and I'm a hairstylist. MATT MITCHELL: The business of hair is a personal one. She's known some clients for years. But getting to know people quickly is part of the job. MATT MITCHELL: Her job is a masterclass in juggling roles. She plays the part of consultant, hairstylist, confidant, and perhaps most importantly, hostess. MATT MITCHELL: That hospitable urge began early. As a child her family left Jordan, flying 9,000 miles to start a new life in Syracuse. Her parents were anxious about what awaited them in America. But Mirvat? She had one goal in mind. MATT MITCHELL: The local weather took some getting used to. Back in Jordan, you might not see a raindrop from May to October. But as she puts the final touches on a client's blowout, she explains that the climate was far from the biggest adjustment. Moving to a college town like Syracuse presented a few culture shocks to her mother. 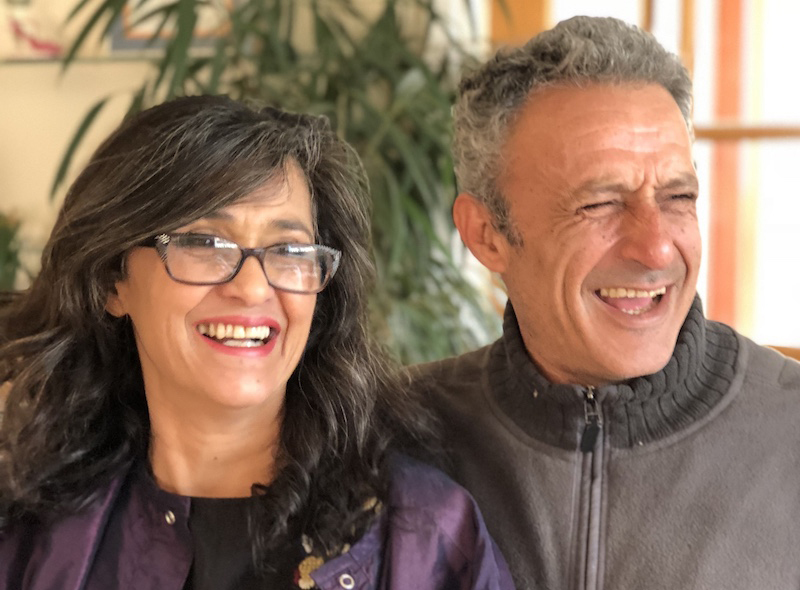 MIRVAT SANDE: Having such a big family and being, you know, from the Middle East, my family tried to hold as much as they could to our culture. Tradition was tradition. We spoke Arabic, we ate Arabic food. My mom barely spoke English. The only English she knew was from soap operas, OK.
MATT MITCHELL: Mirvat's hair is full, dark, wavy, curly, and there's a lot of it. Gold and silver bangles extend up her arms, and she wears rings on nearly every finger. It's been her business to stay on top of trends. Since her start in the early 80s, she learned mastering hair fads can pay off down the road. MATT MITCHELL: But you don't become a great hairstylist just by studying fashion icons. It also demands some special interpersonal skills. MATT MITCHELL: Luckily, an infectious energy is the only things that spreads in her salon. Every meeting with Mirvat is an upbeat experience, even if it begins by feeling underdressed. Unfailingly fashionable, she sees hair as the crown jewel of someone's personal style. And even though her road to hair fashion started early, that path is littered with plenty of "wardrobe malfunctions." MIRVAT SANDE: OK, so when you're in beauty school, you learn how to cut hair with angles, OK. And, depending on you hold the hair at any one of those angles is going to give you whatever effect. So, I had learned all the angles in school that day. (laughing) and I had a sister that needed a haircut and "ooh what a great idea." I think this angle, if I cut the sides using that angle, ooh this haircut's gonna look good. No it didn't. I think I put every angle in that one haircut. [laughing] I probably ended up blowing it dry for her every day until it grew out. MATT MITCHELL: But these missteps served her well. After school she was ready to go pro. MATT MITCHELL: The owner sold that salon and, before long, she'd meet her husband and head south, working as a stylist in Florida. But after a baby boy arrived, she knew her ideal salon was a one chair operation. MIRVAT SANDE: I moved back and I couldn't do it. I couldn't work for somebody anymore. I was just too old. I needed to have my own hours, be able to raise my kid. And then my brother came into this opportunity of this empty space to open up my own salon. So there's the bar downstairs, it used to be a funeral home and people lived up here which was their apartment and downstairs was the funeral home. So now there's a bar downstairs and up here, I've made it my salon. I was blessed to be able to have my own place and be able to keep it going with just myself working. MATT MITCHELL: Going it alone can be tough. But it also means getting to decide everything. MIRVAT SANDE: I almost hired somebody and the first thing she did after she was picking where she was going be in the salon to work, she gave me a list of things I couldn't talk about in front of her clients. I guess she heard me talk (laughing). I did not want that. I wanted to be me. MATT MITCHELL: The one-on-one nature of the business clearly suits her. She wants to make people happy. And not just clients. Friends. Strangers. The mailman dropping off junk mail. People are drawn to her, and vice versa. MATT MITCHELL: She confesses a deep desire to please... which can be hard in this kind of work. MIRVAT SANDE: You want to be good. You wanna be perfect. That's not the way it is. It's hard if somebody's not satisfied; if I can't please somebody. But I've also realized you can't please everybody. I've never had anybody go nuts in my chair, like "oh my gosh, what did you do?" But there's been like body language or actions or whatever and then somebody doesn't show up. So you kinda know. Does it make you feel bad? Yeah. That feeling I don't like. MATT MITCHELL: Mirvat should feel good about her job security. After all, hair's a two person job, right? One to grow and another to cut. But a hundred years from now, does she think hair stylists like her will still be around? MATT MITCHELL: For those unfamiliar, the Flowbee is a small shopvac that promised 1980s America "perfect haircuts for the whole family." But as someone who's used a Flowbee to butcher a loved one's hair, I can safely say the robot hair cutting revolution is not looming. And besides, at its best, the job extends beneath the roots, too. MIRVAT SANDE: I was trained to book an hour for every haircut. It should only take you 10-15 minutes to do a haircut. An hour because that's the personal time you give to somebody. It's like therapy. BRONTE SCHMIT, HOST:Thanks Matt. When not in her salon, Mirvat can be found at Syracuse estate sales. A big fan of 50s style, a parking spot in her garage is currently occupied by an elegant mid-century dresser... which we're told was "a deal too good to pass up." BRONTE SCHMIT, HOST:Thanks again to Matt for speaking with Mirvat. This episode was written and produced by Matt Mitchell, with help from Julianna Whiteway. Our theme music was by Logan Piercey. I've been Bronte Schmit. It's time for us to clock out.